Today InFocus - which proudly takes credit for introducing one of the first (if not the first) all-in-one interactive flat panels in the Mondopad - announced what you could call a family of Mondopads designed for specific use cases and environments. Or as they put it in their pre-announcement briefing: "take the Mondopad down market." I wasn't aware that the Mondopad Ultra was all that "up market" but the mix has a strategy and logic to it. And the company clearly has the big three UC players (Microsoft, Cisco, and Google) in its field of view when it claims that there are "other workflows, and many organizations don't want to be locked into Office 365 or G Suite or Webex Teams." More on that co-opetition thing later. Mondopad Core is the baseline of the new Mondopad, offering a solution designed for (as they put it) "small businesses, government agencies, and huddle rooms." You get a 4K, business-grade touchscreen with embedded Android and a suite of tools for casting, whiteboarding, viewing documents, and browsing the web. Users can view and present documents, photos, and videos, and annotate and save changes in real time. An interactive whiteboard lets users write or draw on a multi-screen canvas, as well as paste backgrounds and images onto the whiteboard and annotate with a collection of digital pens, shapes, lines, and colors. Saved documents can be sent as common or secured files by email, over the office network, or saved on a USB or cloud-based service such as DropBox. This device can be upgraded to include a PC platform with a seventh generation Intel i7 PC to build a more powerful touchscreen solution with Windows 10 Pro. Designed for organizations like universities and government agencies that need easy access to shared software and tools, such as video conferencing services, presentation apps and project management software, Mondopad Launch is a configurable solution for group workspaces. Building upon the Mondopad Core model, Mondopad Launch adds a seventh generation Intel i5-based Windows 10 Pro PC and additional customization options. A lock-down feature allows individual users to login and quickly gain access to only the apps they care about, and a customizable home screen with large, easy-to-access buttons for quick meeting launch. 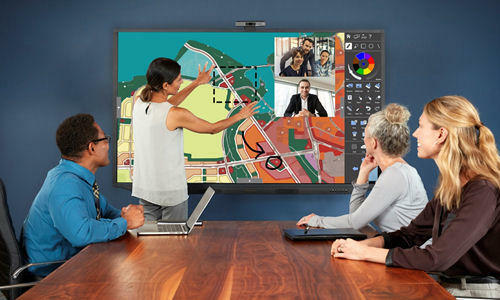 Unlike the Mondopad Core, Mondopad Launch includes a 4K camera for collaboration and face-to-face meetings over video. The company brags about the flexibility you get: choose to use whatever video conferencing client you wish, such as Zoom or GoToMeeting or Skype for Business. There are a few other bells and whistles, such as a dialog box in the lower right corner that lets a user see what's going on with the device (apparently engineers and such love this feature). It offers a Standard Edition of what InFocus calls Quicklaunch, which makes scheduled video calls easily accessible from a calendar. The company has partnered with Ireland-based DisplayNote to make available its Montage wireless presentation system so that up to six users can easily cast and share content wirelessly - and annotate for all to see. I've seen before, with a UX change and a lot more functionality packed in. 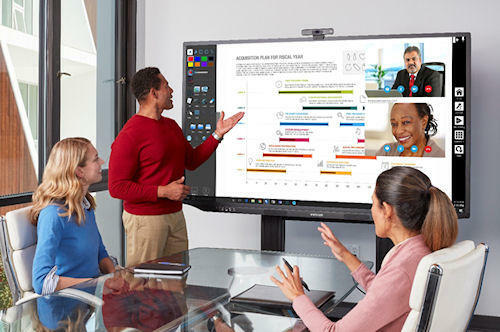 Ultra uses the 7th gen Intel i7-based Windows 10 Pro PC, with an integrated suite of collaboration apps including video conferencing, whiteboarding, casting, a web browser, and full Microsoft Office suite for a truly efficient face-to-face collaboration system. Besides the 4K camera, mic, and wireless keyboard with integrated touchpad, Mondopad Ultra includes an InFocus ConX Cloud video conferencing subscription. When signed onto ConX Cloud or any other video conferencing solution, users in various locations can also launch ConX Whiteboard to interact and share ideas on a Mondopad Ultra whiteboard simultaneously. Users can securely connect and share content, and they can control the Ultra screen from their remote devices. Ultra includes new Ultra v3.0 software and a new mobile app, and users can login to their Office 365 account to instantly access and share information from email and attachments, calendar, documents stored on OneDrive or SharePoint. The new v3.0 software is also compatible with all previous generations of Mondopad Ultra. Additional features: InFocus worked with Microsoft to enable a nifty approach to logging in: use a Mondopad app on a cell phone, scan your QR code, and log into both a meeting and/or Office 365 for instant productivity. Ultra and Core are shipping now, and Mondopad Launch will begin shipping in November. Worth mentioning: these three platforms come in consistent sizes: 55-inch, 65-inch, 75-inch and 86-inch models. May the skirmishes continue! 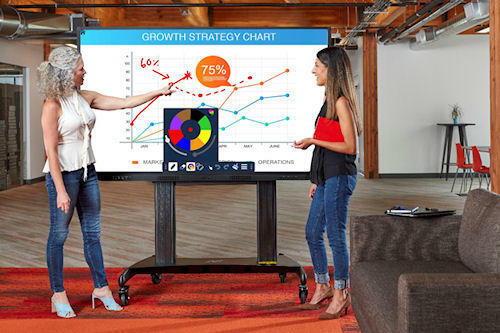 InFocus is acknowledging the impact that the big three have had on the collaborative flat panel (aka ideation tech) market: And I must say, I really enjoy somebody saying there's more to life than being a Teams, G Suite, or Teams (ok, Webex Teams) device sitting in a conference room or classroom. Hey, don't get me wrong: I'm rooting for everybody. But it's intriguing to think about this: from the start InFocus delivered a Windows-based platform. Not Teams. Not SfB. Not SMARTos or whatever SMART called its UX. Not a Crestron or AMX-style bunch of buttons. Instead, it took the approach that Windows is the OS most businesspeople (and some educators) know, and then added its own UX with its own functionality. The company gambled that users would be comfortable quickly with a Mondopad. I think that strategy was effective. Think about the amount of bitching that you hear about traditional interactive whiteboards (aka "we bought them, but nobody used them") that then began to bleed into the collaborative flat panel discussion. Now InFocus is spreading its wings. You want an out of the box solution? Ultra is for you: get your video conferencing (4K camera and mic array), an integrated suite of collaboration apps, ConX subscription, etc. You want even more flexibility? Get the Mondopad Launch, designed specifically for using other apps and services, with 4K video & mic array to use with your service of choice, as well as the Quicklaunch interface and Montage casting to in-room devices. You want a simple touchscreen solution - no video, but with embedded Android OS and an open pluggable specification (OPS) bay for an optional Windows 10 PC? You got it in the Mondopad Core. The A/V reseller crowd knows InFocus well and the company has a strong channel. Its product is getting bought and used and is highly differentiated from a lot of other manufacturers. While my buddy Steve is off chortling about video being the new voice, I'm going to one up you, Steve: maybe the conference room wall is the new palette for the knowledge worker, one providing a slew of new opportunities for including the thinking person's work (ergo content, brainstorming, process engineering, art, workflow that makes sense, etc.) 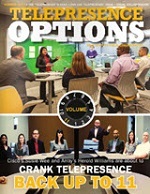 and guess what, these ideation products got video, too! Woo hoo! Alan is an expert on collaborative meeting and educational technologies and the application of these to team productivity, education, and e-Learning. He contributes to the Wainhouse Research Visual Collaboration, Streaming and Webcasting, Learning, and Unified Communications services. He has more than 25 years experience as consultant, analyst, communicator, and strategist, and significant experience helping start-ups launch their products, and larger vendors devise new products and services. He is the author of hundreds of reports, surveys, forecasts, research notes, and profiles related to collaboration, video conferencing, web conferencing, online meetings, distance education and e-Learning, Learning Management Systems, Learning Experience Platforms, Learning Relationship Management, ideation and interactive boards / brainstorming technologies, mobile video, virtual worlds, and lecture capture. He also contributes to the Wainhouse Research Blog. Alan has keynoted or presented at dozens of events, including the Wainhouse Research Summit, InfoComm, USDLA, Telecon, Collaborate, ITCA, statewide distance educational associations, ISTE, Online Educa, ED-NET, Blackboard World, ATD, Panopto, Sonic Foundry, Telstra, and other conferences. He has delivered dozens of webinars for the likes of Polycom, Cisco, SMART Technologies, Nureva, Adobe, GoToMeeting, InFocus, Blackboard, D2L, SAP, Panopto, Sonic Foundry, West, Education Networks of America, ISTE Video conferencing SIG, and many others. He specializes in primary end user research, and is a Burke Institute-trained focus group moderator and interviewer. Past end user clients include Accenture, Utah Ed-Net, BC-Net/University of British Columbia, Jackson Laboratory, University of Wyoming Outreach School, Catholic University Leuven, State of Wyoming, Drexel University, University of NSW Australia, Fort Worth Museum of Science and History, and Touro University Nevada. Alan is considered an International authority on visual collaboration, distance learning, ideation, telecommunications, and multimedia technologies, and has been quoted in The Wall Street Journal, Chronicle of Higher Education, USA Today, Inc. Magazine, Asia Business, and many other publications. He joined Wainhouse Research in January 2003 after stints from 1987-1994 and 1998-2002 in his own consulting practice. Prior to joining Wainhouse Research he held marketing positions with Texas Instruments (multimedia and early voice services), VTEL (video conferencing and early online collaboration), and several Austin, Texas-based start-ups. He holds an M.A. from the University of Texas at Austin and a B.A. from Hampshire College, Amherst MA. For vendors, service providers, venture capitalists, and resellers, Alan offers product & market validation, product positioning, forecasting, thought leadership, brand strategies, and end user research such as online or brick-and-mortar focus groups, executive interviews, and online research. For end user organizations, Alan draws on years of experience helping corporations, universities, statewide networks, and training organizations implement new technologies and programs to support adoption, drawing on his extensive knowledge of the collaboration and distance education / training user and vendor communities. Today InFocus - which proudly takes credit for introducing one of the first (if not the first) all-in-one interactive flat panels in the Mondopad - announced what you could call a family of Mondopads designed for specific use cases and environments. Or as they put it in their pre-announcement briefing: \"take the Mondopad down market.\"
I wasn't aware that the Mondopad Ultra was all that \"up market\" but the mix has a strategy and logic to it. 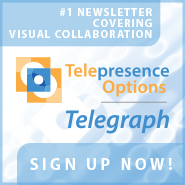 And the company clearly has the big three UC players (Microsoft, Cisco, and Google) in its field of view when it claims that there are \"other workflows, and many organizations don't want to be locked into Office 365 or G Suite or Webex Teams.\" More on that co-opetition thing later. Mondopad Core is the baseline of the new Mondopad, offering a solution designed for (as they put it) \"small businesses, government agencies, and huddle rooms.\" You get a 4K, business-grade touchscreen with embedded Android and a suite of tools for casting, whiteboarding, viewing documents, and browsing the web. Users can view and present documents, photos, and videos, and annotate and save changes in real time. An interactive whiteboard lets users write or draw on a multi-screen canvas, as well as paste backgrounds and images onto the whiteboard and annotate with a collection of digital pens, shapes, lines, and colors. Saved documents can be sent as common or secured files by email, over the office network, or saved on a USB or cloud-based service such as DropBox. This device can be upgraded to include a PC platform with a seventh generation Intel i7 PC to build a more powerful touchscreen solution with Windows 10 Pro. But it's intriguing to think about this: from the start InFocus delivered a Windows-based platform. Not Teams. Not SfB. Not SMARTos or whatever SMART called its UX. Not a Crestron or AMX-style bunch of buttons. Instead, it took the approach that Windows is the OS most businesspeople (and some educators) know, and then added its own UX with its own functionality. The company gambled that users would be comfortable quickly with a Mondopad. I think that strategy was effective. Think about the amount of bitching that you hear about traditional interactive whiteboards (aka \"we bought them, but nobody used them\") that then began to bleed into the collaborative flat panel discussion.